Good morning, I’m Democratic State Representative Megan Rochelo from Biddeford. While most of us are celebrating the holiday season this week, lawmakers are gearing up for a new legislative session in Augusta. This week, we received a much-anticipated Executive Order from Governor Paul LePage to cut state spending to meet a $35.5 million shortfall in revenues collected by the state. The governor is required by law to issue the order, called a curtailment, when the state’s revenues are lower than expected. So, you may be wondering why we are facing a shortfall in revenue. The revenue shortfall is due to a lagging state economy. While many states across the country have begun to emerge from the recession, Maine is one of only three where are revenues are below projections. According to the U.S. Bureau of Economic Analysis, Maine is the only state in New England where the economy shrunk last year. The truth is Maine’s economy needs a boost. We need to put more people back to work in the jobs we have now, so they have more money in their pockets to shop locally and in turn help the whole community and the state. And, we need an action plan to grow Maine’s economy long term. We won’t cut our way to prosperity. It’s time for Maine to invest in our state. We must put our state back on track. Lawmakers will have to make choices on how we balance the budget. As a state we need to have an important conversation about our priorities. 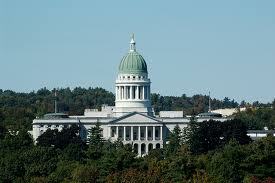 Governor LePage gave us a starting point this week with his spending cuts. While Democrats don’t agree with all of LePage’s cuts to education, public health and safety programs, we know we have to work together with our Republican colleagues to stabilize our budget, make our government work better for you, and ensure that we invest in our future. And our work has only just begun. We will have to close a shortfall in our Health and Human Services budget and we have significant shortfall projected in our next budget partly due to unfunded tax cuts that largely benefit the rich. The cuts being proposed are only the tip of the iceberg. We have to ask ourselves if cutting K-12 and higher education makes sense when we should be making sure our children and our workforce are prepared for the future. We face a serious skills gap that can’t be solved without strong schools and training programs that work. Is now the time to cut mental health and public safety budgets when we have seen one tragedy after another involving violence and individuals suffering from mental illness? Shouldn’t we be looking at how these programs can work better to make us safer and better serve the people of Maine? Should student loans and adoption services be on the chopping block? Shouldn’t we be creating more opportunity for Maine people, not less? As lawmakers it’s our job to make sure we are very thorough and open minded– not driven by ideology. Now more than ever Maine people need us to put partisan politics aside and get to work on reasonable and fair solutions that will get our economy moving again. Lawmakers are taking immediate action to convene the Appropriations committee ahead of schedule to review the spending cuts and begin that important conversation about our priorities. I’m honored to be part of that committee to serve the people of Maine. We will need your guidance in the tough months ahead. Thank you for listening. I’m Rep. Megan Rochelo from Biddeford. Have a safe and happy New Year. The number of motor vehicle crashes, deaths, and related injuries occurring on our roadways continue to have a devastating toll on our citizens and visitors to our great State. As of this past week, 163 people have died on Maine roads during 2012 and that is too many deaths, too many relatives, too many friends and too many Maine citizens. The safest driving occurs when drivers direct full attention to the road and their surroundings. Most alarming is the number of young drivers killed as a result of distracted driving. Sadly, 14 teens have died on Maine roads during the past year. Twenty-seven fatalities involved 20 to 24 year-olds. Unfortunately, too high of a percentage of all crashes are due to driver error. Last year, roughly 10 percent of vehicle fatalities were a result of distracted driving. Law enforcement is serious about cracking down on distracted driving and texting while behind the wheel. While no state bans cell phone use for all drivers, many prohibit use by young drivers. Thirty-two states, including Maine, ban cell phone use by novice drivers and texting while driving is illegal for all motorists in Maine. I would also like to take a moment to talk about the importance of buckling up. Seatbelts save lives. Each year, approximately 42,000 Americans die in traffic crashes and another three million are injured. Many of these deaths and injuries are preventable if the victims had been wearing safety belts. Fifty percent of young drivers in Maine who die in motor vehicle crashes did not buckle up. It is important to protect our citizens. That is why I support the effort of the Maine State Police in stepping up enforcement of seatbelt violations, especially for young drivers. In addition to this effort, law enforcement across our State will be looking to prevent drunk drivers from getting behind the wheel. Federal money is helping pay for the ‘Drive Sober Maine!’ campaign that started in December and will continue into the New Year. Fifty-two Maine highway agencies, from Fort Fairfield to Kittery will work overtime to patrol at places and times where drunk driving is most common. Alcohol related traffic deaths doubled in the first six months of 2012 with 32 OUI deaths compared to 15 deaths during the same period in 2011. Whether it is drinking and driving or distracted driving – the consequences of either are too great. Lives are on the line and no life is worth losing. As we head into 2013, it is my sincere wish that all Mainers enjoy the journey ahead of them. Do not drink and drive and think twice about texting when behind the wheel. A safe driver is a responsible driver. Ann and I would like to wish everyone a very safe and prosperous New Year. Celebration and family are at the heart of the holidays. It is a time of giving to those less fortunate, remembering our troops around the world who are fighting to keep us safe, and reflecting on the year gone by. Ann and I recently had the opportunity to visit one of the most sacred grounds of our nation, Arlington National Cemetery. As the final resting place for more than 400,000 military war casualties and their families, dating back to the Civil War, I, again, was reminded about the true value of freedom. Freedom is not free – it is a privilege bestowed upon us thanks to the bravery and dedicated service of our military members. It is a humbling experience to walk the rolling hills laying wreaths on the gravestones of America’s heroes. A national shrine, the cemetery is a living history of American freedom. The names engraved in stone served our nation with dignity and honor. We are forever grateful and treat their families with respect and compassion. I would like to share a story of one veteran we visited. Before my wife and I left, Ann received a note from a Navy veteran, Gair MacKenzie, from Bridgton, who wrote about the life of Commander Robert Schlegel, of the United States Navy, a shipmate and friend. Commander Schlegel was born in Gray and was the first Mainer killed as a result of the terrorist act on the Pentagon September 11, 2001. He was 38 years old. Commander Schlegel’s gravestone is located at Arlington and paid our respects. Ann and I laid a wreath and our family said a prayer. It was a humbling moment we will never forget. Our Nation lost a great many people, yet our spirit is not broken. We continue to fight in the name of freedom because it is the foundation which our land symbolizes. On Friday, I spoke by video phone with the 488th Military Police Company from Waterville and Houlton. One hundred Soldiers from the unit are in Afghanistan. They deployed in July and we anticipate their safe return in about six months. I also spoke with members of Charley Company First of the 126th Aviation from Bangor. The unit, with 79 Soldiers, is in Kuwait. They deployed in May and will return in January. Additionally, four members of the 121st Public Affairs Detachment are in Kosovo. And one of those members was able to join us. As you and I are fortunate to celebrate with family and friends, the holidays are especially difficult for families with deployed loved ones. It was an honor to thank them for their service and let them know they are in our thoughts and prayers. We prayed for many fellow Americans throughout the year and especially in recent days. Let us be thankful as Christmas nears for our family, children, friends and community. In times of tragedy we band together as Americans. 9-11 proved America’s resolve and Sandy Hook is doing the same. We move forward, but we never forget. God Bless America and I wish you and yours the very best as we head into the New Year. With all of the 126th Legislative races now settled and all names known, it is time to look ahead to 2013- not just the new members, but possible shake ups in the joint standing committees (For more info: “Rule 301. Joint Standing Committee Responsibilities and Jurisdiction”).